A Class representing a World and the related methods for drawing the world and handling various events. In order to implement a functioning World you must extend this class, and implement an onDraw method. Other handler methods (tickRate, onTick, onMouse, onKey, onRelease, stopWhen, and lastScene) are optional, and can be overridden to add new functionality. 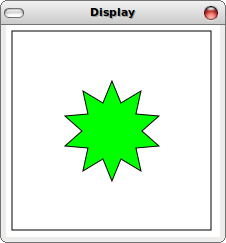 Simple and generated images can be displayed in a Window using the static method display(Image). 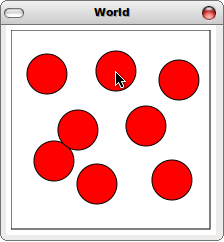 Below is a simple example of a World that adds a new point at each mouse click. The world contains a Scene and a new Circle is placed for each "button-down" event received. Opens a new Window and displays the given Image/Scene, returns true once the window is closed. Produce a (possibly) new World when a key is pressed. Produce a (possibly) new World when a mouse event is triggered. Produce a (possibly) new World when a key is released. Produce a (possibly) new World based on the Tick of the clock. Return the tick rate for this World in seconds. For example, 0.5 means two ticks per second. The rate is only accessed when bigBang() is initially called and the window is created. Produce a (possibly) new World based on the Tick of the clock. This method is called to get the next world on each clock tick. Produce a (possibly) new World when a mouse event is triggered. x and y are the location of the event in the window, and event is a String that describes what kind of event occurred. Produce a (possibly) new World when a key is pressed. The given event is a String that describes what key was pressed. Produce a (possibly) new World when a key is released. The given event is a String that describes which key was released. Kick off the interaction/animation. This method returns the final state of the world after the user closes the World window.